This year I have two types of tomatoes growing in abundance. The large heirloom variety is called Goldie. I purchased a seed packet from Fedco two years ago and have grown them each year. I do not think that I can imagine summer without them now. So this year I started saving the seeds, which I think I will do the same for the abundant variety, the Black Cherry tomato. I also purchased from Fedco, but at a discounted rate at the Common Ground Fair here in Maine. I think I have gotten my money’s worth out of both packets. My son is currently exploring solid food and these area a quick and easy favorite of his, I puncture the tomatoes, so he doesn’t spray the juices everywhere when he bites into it – but that does not stop him from making a mess! 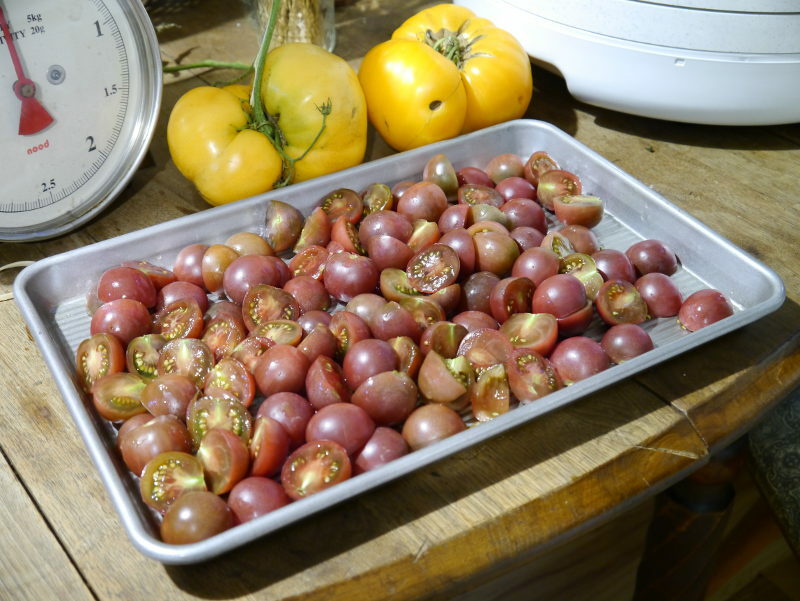 The Black Cherry tomatoes are fittingly described as a “two-bite” tomato on the Fedco website, the write up also states that they ripen slowly, but are worth the wait. Well, I have waited, and now that they are in abundance I need to get creative with them. Canning these little guys is doable, they are large enough to remove the skin and process in a water bath. 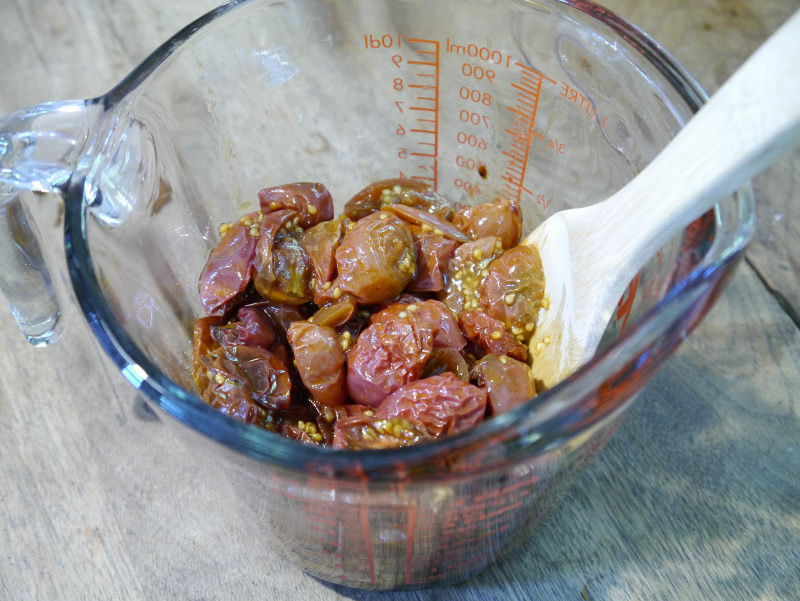 I have done it with some of the recipes where I need a certain amount of tomatoes, say 20 lbs, but I only have 15 lbs of the Goldie’s on hand and 5 lbs of the Black Cherries, but it is tedious and slows the whole process down. 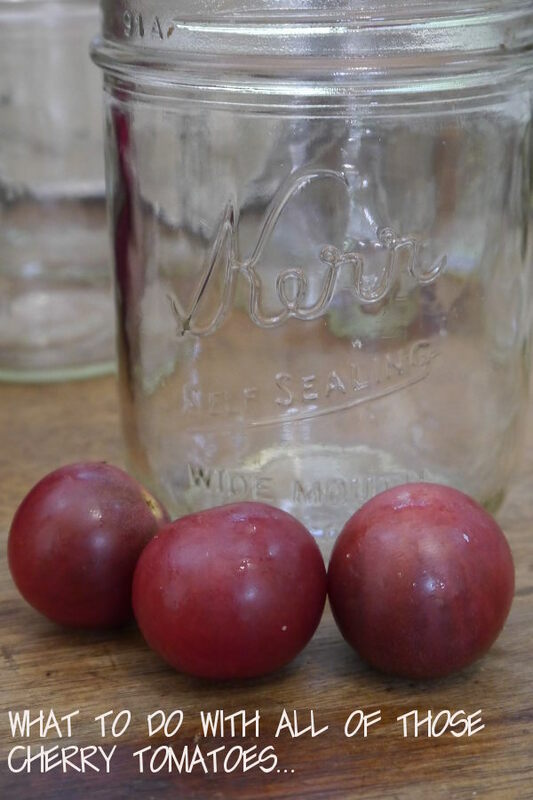 Recently, I found this post about roasting cherry tomatoes. The result is amazing with the Black Cherries, but I had to alter the timing because my “two-bite” tomatoes are twice as big as the recipe calls for. Once they are roasted I bagged them up in quart bags to freeze – meal results are still to be determined, but I am thinking spreading this sweet goopy goodness on pizza dough or crusty bread with a sprinkle of salt. I think I would call the goal for these as ‘spreadable’ – the end result should be mushy, but starting to firm up without becoming chewy.